Did you know that your nails can reveal clues to your overall health? A touch of white or yellow here, a rosy tinge there or some rippling/bumps in the surface can be a deficiency or sign of disease — an underlying problem — local or maybe in the liver, lungs, or even your heart. These imperfections may not look much to you, but to the trained eye, nails can provide a valuable window to your overall health. Read the Signs to learn what secrets your nails might reveal. 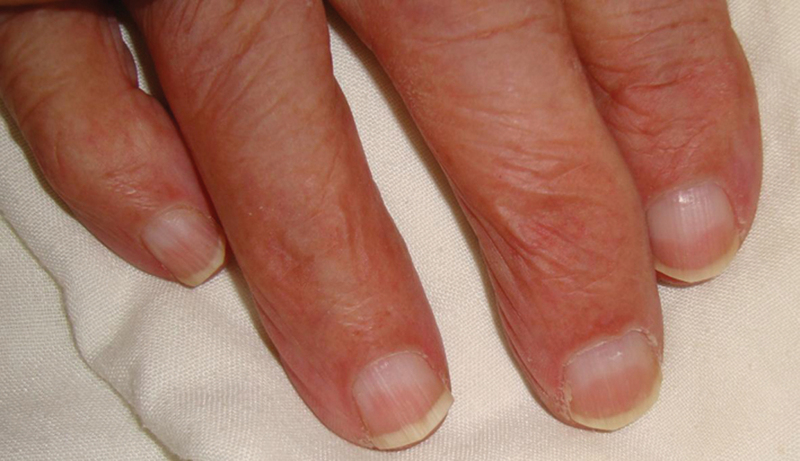 White nails or Terry’s nails — chronic liver conditions such as hepatitis or cirrhosis. They could just be contributed by aging too. 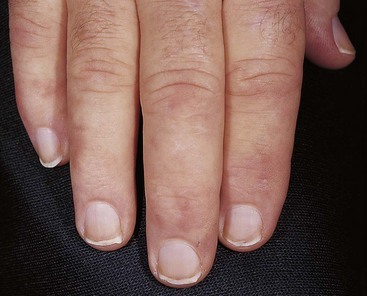 Half-and-half nails — generally half pink and half white — kidney disease. 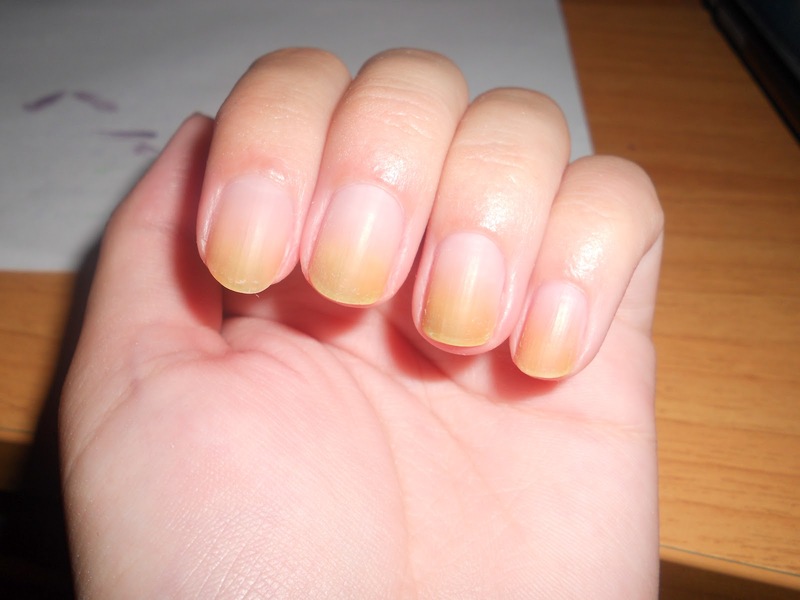 Yellow and thick nails with a slowed growth rate — lung disease, severe thyroid disease, diabetes, psoriasis or a fungal infection. 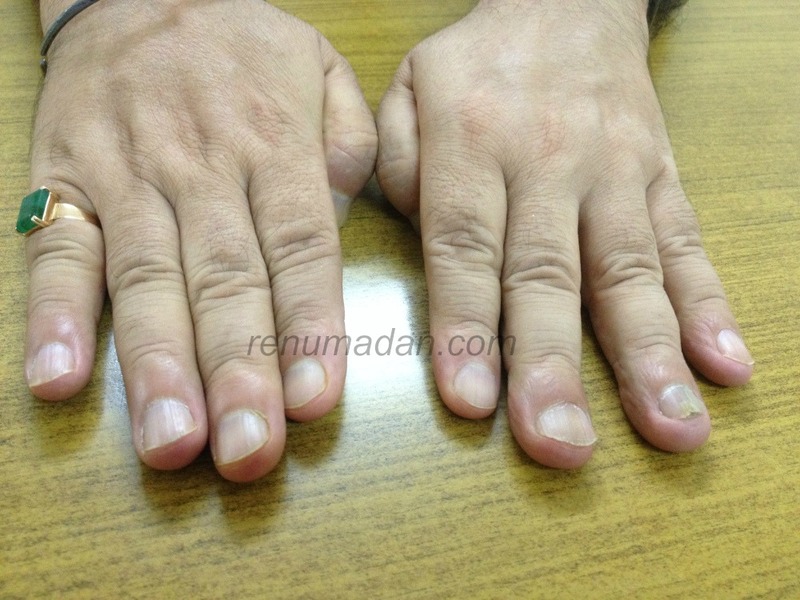 Pale nail beds — anemia, congestive heart failure, liver diseases or malnutrition. Yellow hue of the skin with yellow-tinged nails evident more distally — diabetes. Bluish tint means the body isn’t getting enough oxygen — lung problem, such as emphysema, heart disease. 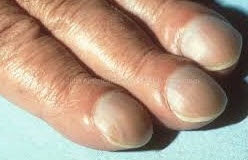 Rippled or pitted nail surface with ice pick-like depressions — early sign of psoriasis or inflammatory arthritis. Dry, brittle cracked or split nails — thyroid disease, natural aging process or overexposure to water and chemical solvents such as household cleaning solutions. If combined with a yellowish hue, its more likely due to a fungal infection. 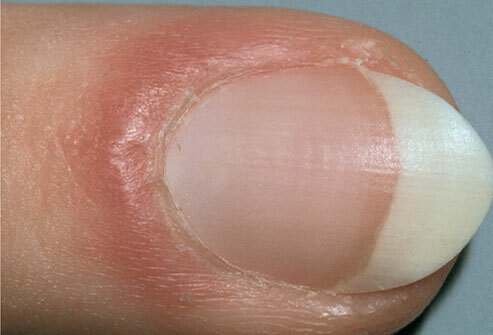 Puffy or inflamed nail fold (paronychia) — connective tissue disorder like lupus, or any other infection. Dark lines beneath the nail — melanoma, skin cancer. 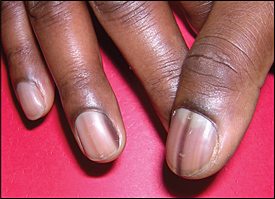 These hyper-pigmented bands can occur as normal variants in 90 percent of blacks. Red streaks are a warning of a heart valve infection. Green nails — a sign of bacterial infection. 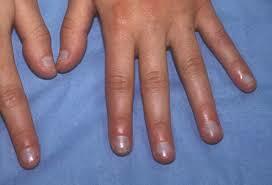 Gnawed nails — Nail biting or picking, linked to persistent anxiety or obsessive-compulsive disorder. Onychocryptosis or ingrown toenail — due to ill-fitting footwear with an inadequate toe-box room or tight stockings that apply pressure to the top or side of the foot, dampness in the enclosed shoes. 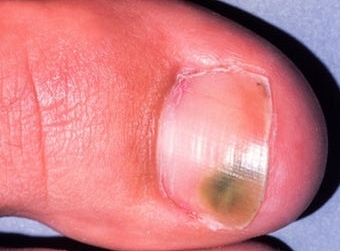 Leuconychia — white lines or spots in the nail plate are nothing but tiny bubbles of air trapped in the nail plate layers due to trauma. Please note that these are not due to a calcium deficiency as per a myth. 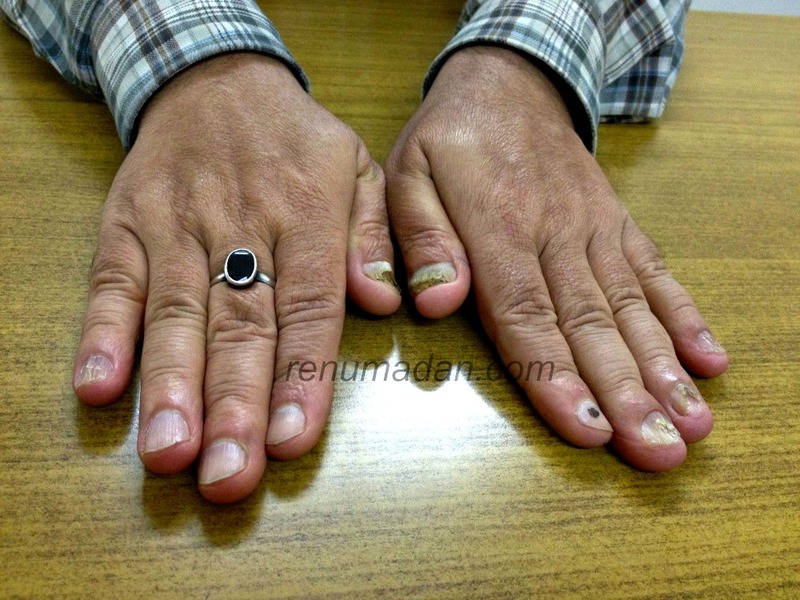 Nail clubbing — nail tends to be raised and circular and instead of coming straight out, it curves down — a sign of low oxygen in the blood or lung disorder, inflammatory bowel disease, cardiovascular disease, liver disorders or AIDS. 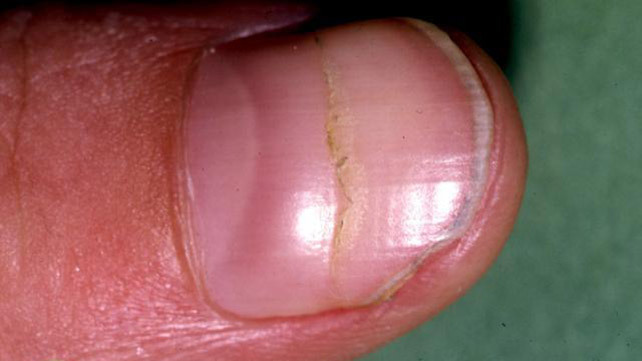 Koilonychia or Spoon nails — characterized by reverse curvature or a significant dip in the middle of your nail capable of retaining a drop of water — sign of iron deficiency anemia, heart disease, hypothyroidism, or a liver condition (hemochromatosis) where your body absorbs too much iron from the food you eat. Beau’s lines — horizontal lines run cross the nail. The indentations can appear when growth at the area under the cuticle is interrupted by injury or severe illness such as uncontrolled diabetes, vascular disease, high fever like scarlet fever, mumps, measles or pneumonia. Could also be a sign of zinc or protein deficiency. 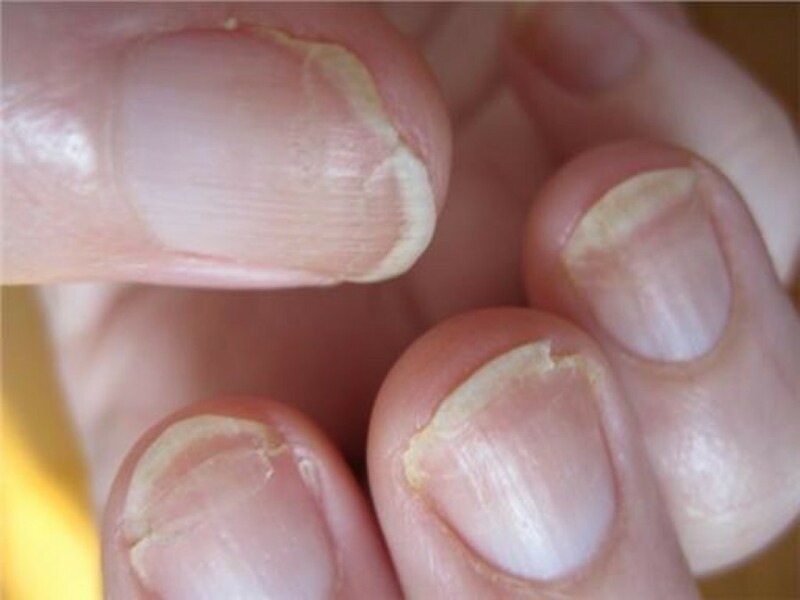 Loose nails — due to injury, infection or a reaction to a particular drug or consumer product, such as nail hardeners or adhesives, thyroid disease or psoriasis. Nails become loose and separate from the nail bed. The separated part becomes opaque with a white, yellow or green tinge. Tinea unguis, Onychomycosis or simply ringworm of the nails, is a fungal infection and may affect toenails or fingernails. 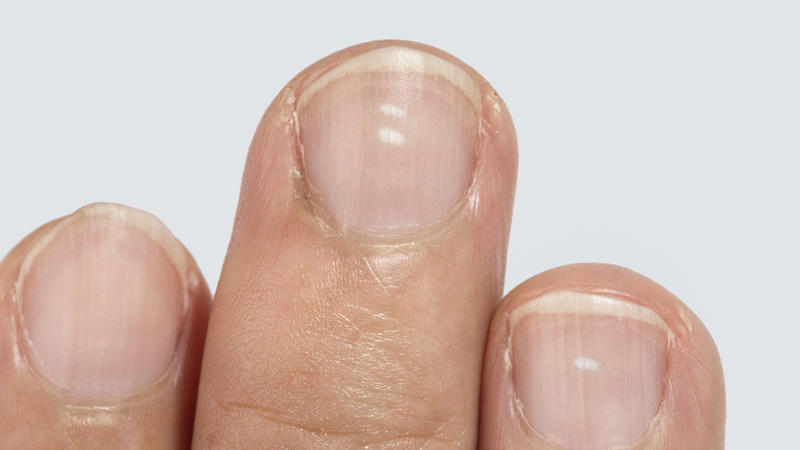 It is the most common disease of nails and constitutes about half of all nail abnormalities. It is characterized by nail thickening, deformity, and eventually results in nail plate loss. Fungal infections are difficult to treat as they take several weeks – months to get better and after you grow back your nail, here comes another infection. The fact is, some people are just at risk for having to easily acquire this infection recurrently in their lifetime. 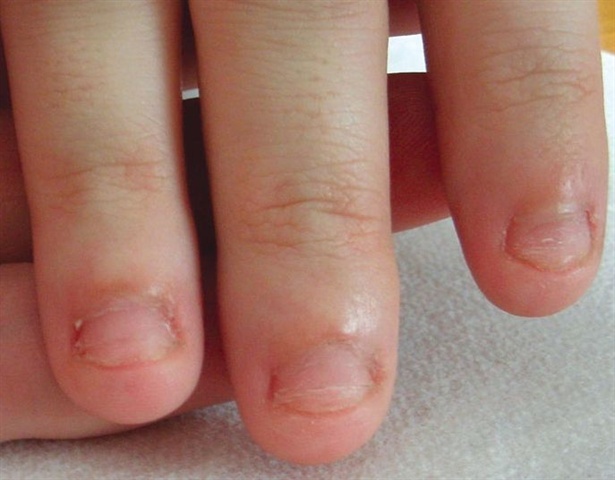 People with onychomycosis experience significant psycho-social problems due to the physically repulsive and abnormal appearance of the nails; particularly when fingers – which are always visible – rather than toenails, are affected. A gentleman visited me in December 2013 with the above mentioned problem, that was taking his self esteem for a down slide. Though there were no complaints of itching or pain or any discomfort, the appearance itself was revolting for him. He avoided meeting people and going out for dinners etc, even though his top level executive profile required him to. Eating with his own hands was becoming an ordeal due to a peculiar odor emanating from them. He was put on a regular homoeopathic treatment for less than a year and this is what we achieved! He still visits my clinic on ‘n off for other problems of his or accompanies his family, but never even once has he come back for the nails! This and many more of the nail illnesses; even most of the surgical conditions, if treated with homoeopathic medicines in the initial stages, yield very good results. Homoeopathic medicines can very well control the pain, swelling or any other abnormal sensation in the nail and the surrounding tissues, take care of the dyscrasia and bring back health to the diseased nails. Medicines like Ruta, Silicea, Natrum Muriaticum and Hypericum are found to be useful in treating ingrown toe nails, even the one’s leading to deformity. Thuja for diseased finger nails with an ugly–waxy look. Myristica Sebifera for pain in finger nails with swelling of the phalanges. Calcarea Carb gives very good results in corrugated nails which are uneven, spotted and irregular, stimulating the growth of new ones. Fluoric Acid is excellent for crumpled ridges. Graphites is helpful when the nails are thickened, rough and deformed like a horn or are brittle and crumbling. Apis M if blood settles under the nails. Causticum for ingrowing nails when Silicea fails. Lachesis for ingrown, proud flesh, purplish, stinging. Magnetis Polus Aust for sore pain of an ingrown toe nail. Very painful on touch or by the shoe pressing on the toes and nails as from corns. Keep your nails clean and dry. Wear rubber gloves when using soap and water for prolonged periods. Stop abusing your nails. Don’t use your fingernails as tools to pick, poke or pry things. Avoid nail-biting. Apply moisturizer to your nails and cuticles every day. Creams with urea, phospholipids, or lactic acid can help prevent cracking. File your nails in one direction and round the tip slightly, rather than filing to a point. Don’t remove the cuticles or clean too deeply under your nails, which can lead to infection. Don’t dig out ingrown toenails – doing so almost always results in ripping living tissue. See a doctor if they become bothersome. Avoid nail polish removers that contain acetone or formaldehyde. Carry your own instruments if you get frequent manicures. If you have artificial nails, check regularly for green discoloration (a sign of bacterial infection). 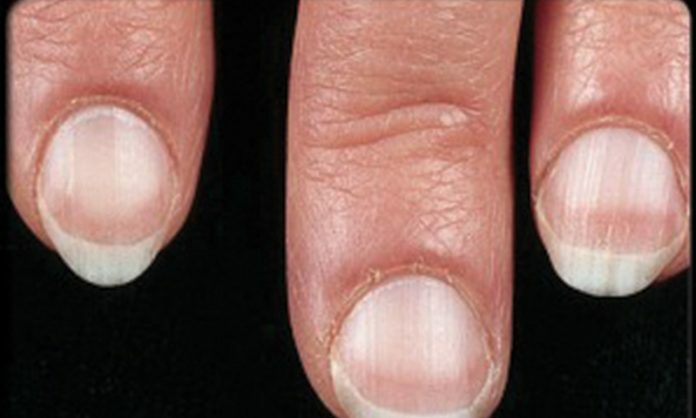 No treatment is required for white spots in nails as they usually grow out with the nail plate. Eat a balanced diet and take vitamins containing biotin. 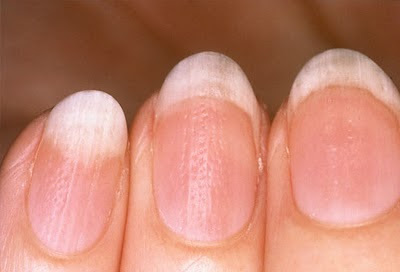 Taking 2.5 milligrams of biotin daily may increase the thickness of nails. Iron, zinc and B12 are the best to strengthen your nails; iron improves the brittleness while zinc and B12 cause a healthy nail growth. As we age, the nail bed’s natural flow of oils and moisture – the cement that holds the nail plate layers together and gives the plate its inherent flexibility, is greatly reduced. Re-hydrating the layers with a good quality cuticle and nail oil containing Jojoba and Vitamin E help dry brittle nails. Jojoba oil has a very tiny molecule which can penetrate the nail plate surface, open up the layers and draw the Vitamin E in after it. The molecular structure of Vitamin E is too large to penetrate the nail plate layers or the surface layer of the skin without the benefits of Jojoba oil. Oiling the nail plate and surrounding cuticle at least twice daily and wearing gloves whenever working with household cleaning solutions helps in preventing nail splits. Do attend to systemic illnessness if any. It’s worthwhile to be vigilant about your nails so that you are alert for any potential dyscrasia in future. Note :: For better results, you must follow the above preventive measures along with the homoeopathic medicines with fervority.